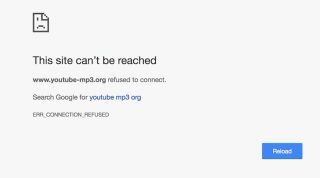 YouTube to MP3 ripping site taken down by music labels | What Hi-Fi? Following legal action from Universal, Sony, and Warner Brothers, YouTube-MP3.org has been made to relinquish its domain and shut down. YouTube-MP3.org, a site that ripped audio from YouTube videos, has been shut down after a group of major music labels - including Universal, Sony, and Warner Brothers - sued it for facillitating piracy. This isn't a particularly surprising outcome; with the major label's legal power, and the fact that the site really didn't have any meaningful defence, it's noteworthy that the battle went on for so long. While YouTube-MP3.org isn't the only site that rips YouTube audio, or video, into a downloadable file formats, it is one of the most popular. In fact, the site was one of the top 400 visited websites in the world, according to Alexa traffic statistics, and the Recording Industry Association of America (RIAA) said that the site's 60 million global visitors per month made it “the world’s largest stream-ripping operation". Websites like this one made their money through advertising, revenues from which naturally go directly to the site rather than to the artist or copyright holders. However, with so many other sites providing similar functions, it's unlikely that we've seen the end of stream ripping. While we'd prefer the world to get behind a good streaming service or even hi-res music (and so would Sony, Universal and Warner), it's likely there's still a way to go.